Our fabulous Post and Beam home is unlike anything else in Bar Harbor. It sits along the shore of Frenchman's Bay. The main floor has a cathedral ceiling with two stories of glass windows overlooking Frenchman's Bay. it was designed by a local builder with attention to detail; it is the perfect escape for guests with the most discriminating tastes. The three story floor plan of this house offers spacious common areas while maintaining privacy for the sleeping quarters. It lends itself both to couples sharing a vacation home and families wanting a separate play area for the children. Walk upstairs to the alcove loft that overlooks the living area equipped for office space or for a quiet retreat. Continue on to the master bedroom complete with a walk in closet and sitting area. The master bathroom has a large walkout shower and granite counter tops. The king size bed has a luxury pillow top mattress. On the main floor the beautiful kitchen is furnished with every amenity including a dishwasher, microwave, electric stove, double stainless sink and complete granite counter tops with a bar open to the dining room making it a perfect place to re-connect with family and friends. Downstairs is a beautiful family room with a second television and lots of room to relax. Beautiful views of the water can be seen from this large area offering a great spot for the kids to play or the guys to watch the big game. Finally, one of the best attractions about this home is its location. It is 75 feet from Frenchman's Bay and has complete access to Frenchman's Bay and the Atlantic Ocean. The house is 8 miles from the enchanting Village of Bar Harbor, Mt. Desert Island’s artistic, culinary, and social center. 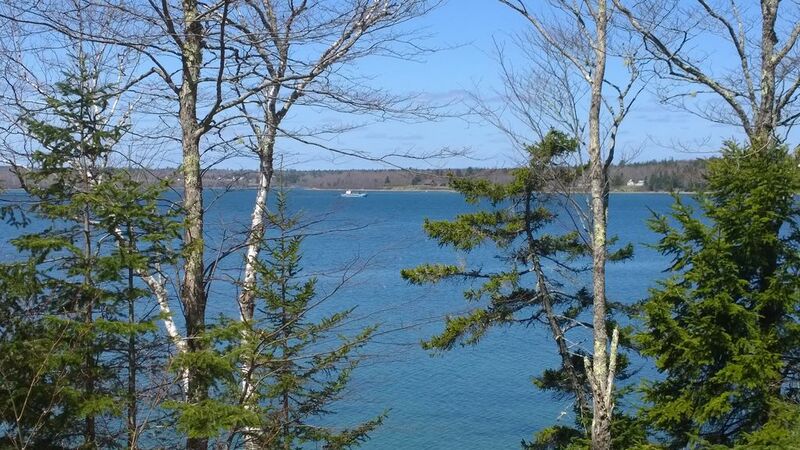 Located on the shores of Frenchman’s Bay, it offers the charm of a small New England fishing village with all the attractions of a major resort including restaurants, shopping, and a lively nightlife. The house is just 5 miles from the entrance to Acadia National Park, Nearby are entrances to some of the best hiking trails in the country, as well as a huge variety of outdoor activities including whale watching, canoeing, kayaking, rock climbing, deep sea fishing, sailing, biking, and much more. Also close by is the popular Sand Beach, Thunder Hole, and Cadillac Mountain, the most beautiful place to watch the sun rise in the country. We invite you to spend a glorious week in our elegant Post and Beam Home. I loved Bar Harbor and Acadia National Park so much after my first visit in 1994 and visited often with family and friends. After a few years I wanted to invest in the area and purchased my first two homes in 1999. In 2001 another property with two homes was added and two more built the following year. Since then I have managed the properties and hosted many groups of families and friends. Having worked for Hewlett Packard for 21 years in sales and account management I had developed a passion for excellent customer service. This business enables me to combine my love for working with clients and my interest in Real Estate I inherited from my dad. I actually am involved with providing a wonderful home base for my guests to enjoy the wonder that is Acadia National Park with their friends and family. Very gratifying are the number of repeat guests and the experiences all have shared about how my homes were part of their wonderful vacation experience. I have to say my favorite part is to interact with guests and after providing details directions and area information end the conversation with "Enjoy!" After buying my first properties we had the opportunity to have dinner at the Post and Beam. It was owned by friends and upon visiting I fell in love. I felt if I could enjoy this home and provide guests this experience I would truly be a fortunate person. Shortly the home went on the market and the journey began. Full access to the bay for kayaking and enjoying the shore front. to the sweeping vistas from atop Cadillac Mountain, there is a special mystique to Bar Harbor. Nestled on the east side of Mt. Park have a wide variety of offerings for visitors. There truly is something for everyone. experience our winter wonderland and the surprises of spring.